The 10kg automatic ABC powder fire extinguisher is specifically designed for use in enclosed spaces such as engine/plant rooms, switch rooms and store areas containing flammable liquids. Especially popular for use on boats. Comes supplied with mounting bracket and 68°c red bulb as standard. Fitted with pressure gauge for easy routine checking. 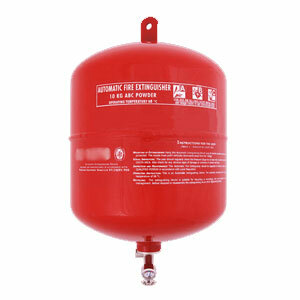 The 10kg automatic powder extinguisher is suitable for all Class A (wood, paper, cloth), Class B (oils, liquids, petrol, diesel), Class C (gases) and electrical fires.